Whenever I am looking for deals on my favorite websites or apps to buy, sell and trade it amuses me to see those people who think they have a piece of junk worth a bunch of money. There are the folk with some really common and unpopular comic from the 1990's who are positive it must be worth at least 100 bucks because, "It's in great shape," and others who insist that their vintage metallic toy has a value of $500 or more...even though its clearly a reproduction of an older toy (that even if it were authentic would fetch all of $50). 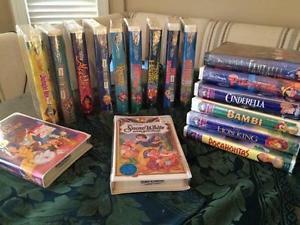 One thing that always makes me laugh however, is the continued insistence of some people that their Disney VHS cassettes that you can find for a buck at the thrift shop are hold value of thousands upon thousands of smackers. As with all things, you can blame the internet for that. As a quick search will reveal (on many sites), old Disney VHS tapes are maybe worth anywhere from $5-$45 in the classic clam-shell design some people refer to as being of the, "Black Diamond Collection." Unfortunately, an article in 2016 by Tech Times simply looked at what people wanted for Disney movies and assumed rubes were actually paying thousands for Disney tapes. In other words, there were a handful of people posting stuff at dumb prices for absurd reasons, then this article came out and inspired a bunch of people to dig-out their dusty Disney tapes and also post them for laughably-high asking prices. Sadly, since 2016 other sites have perpetuated this myth of imaginary value. Seriously, as recently as February of this year there have been websites with new articles that have authors who clearly didn't do their research. Oh you poor, misguided fools! Look, I get it, the idea that we could suddenly achieve some big windfall from something we thought was worthless is always an appealing concept. It is one reason we love to watch programs like, "Antiques Roadshow," or, "American Pickers," but often the people on those shows who are bringing things to be appraised or selling stuff to pickers are collectors themselves who have some relative idea of the value of what they own/ have inherited from a deceased relative who bought the item when it was in fact worthless. Some movies you got in the 1980's and 1990's aren't anywhere near the realm of those kind of antiques. Maybe in a couple centuries your great-grandchildren will discover your treasure-trove of tapes is worth some cash, but as of right now you can't expect your retirement fund to be supported by some copies of, "Beauty and the Beast."